Cambodia has two major elephant ranges, Mondulkiri and Southwest Cambodia. Each of these forest areas total over a million hectares, and are partially protected. 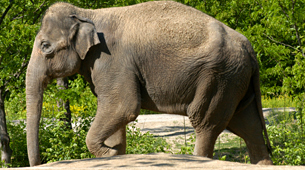 The elephant populations are small, but generally agreed to be stable at around 100 individuals each. Poaching pressure is presently low, but habitat fragmentation and conversion present major threats. Initial stages of this project studied the forest use around area villages, increased crop yields, and lowered the rate of fragmentation around key villages. A number of Human elephant conflict (HEC) mitigation activities were implemented focused on local community groups, called “Guarding Groups”. Local livelihood strategies were studied at some length, ensuring the approach is effective and sensitive and that there is community buy-in on a range of issues. This project will guide and manage the use of land around the elephant range with the assistance of local farmers involving issues of agriculture, land use planning, education and mitigation of human-elephant conflict. * Expand and consolidate guarding groups to all HEC sites in Cambodia by improving communications, formalizing and organizing guarding groups within their communities to promote sustainability, extending the model to all HEC in Cambodia, reevaluating group geographic structures to maximize effectiveness, and conducting farmer cross visits within Cambodia. * Develop team capacity in Participatory Land Use Planning (PLUP) to prevent habitat fragmentation while decreasing HEC through training by local specialists to build capacity into the teams. At least one pilot exercise to examine how this technique is best suited to managing HEC and habitat fragmentation in Participatory Land Use Planning will be initiated. * Support national management of the Cambodian Elephant Conservation Group (CECG) to improve project sustainability by continuing to develop the skills of the staff, with the aim of increasing the effectiveness and sustainability of the activities. The newly established databases will be used to better provide adaptive management to all staff, increasing their ability to use tried and tested methods nationwide. * Begin business planning with farmers growing alternative “elephant-friendly” crops by examining market options for different types of crops working towards sustainability of various harvests, particularly considering the need for affected farmers to grow crops that elephants find unpalatable. Results of this project will include protection of forest in targeted locations, improved crop yields, increased capacity of CECG staff for implementing conservation activities, improved social cohesion of guarding groups of local villagers near to elephant areas, reduction in poverty whilst improving local attitudes to conservation, and people and wildlife living peacefully with each other despite occasional inconveniences on both sides.